View More In Microcentrifuge Tube Racks. 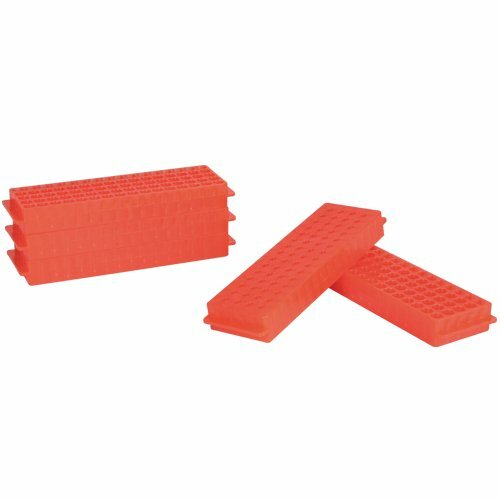 Perfect for benchtop use or freezer storage, this double-sided polypropylene rack accommodates 0.2ml thin-walled PCR tubes on one side while the opposite side holds 1.5ml to 2.0ml microcentrifuge tubes. 80 wells on each side keep tubes upright in a 5 x 16 array and are numbered for easy sample identification. Twelve rack colors assist in sample organization and quick visual identification. Molded in handles provide a secure grip for transport and a matte side panel accepts tape or direct labeling. Racks can be used for freezer storage down to -80 degree C (-112 degree F) and can be autoclaved at 121 degree C (250 degree F).